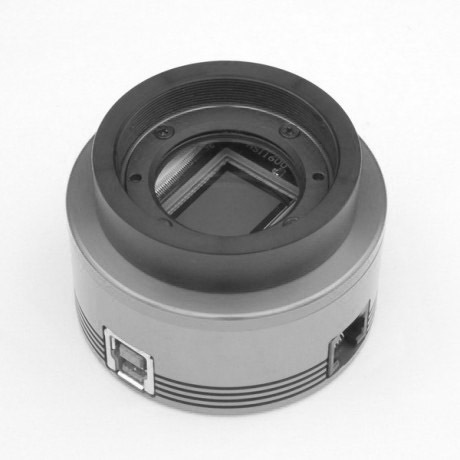 The ASI128MC Pro camera integrates the Sony IMX128 full-frame sensor (36 mm x 24 mm). 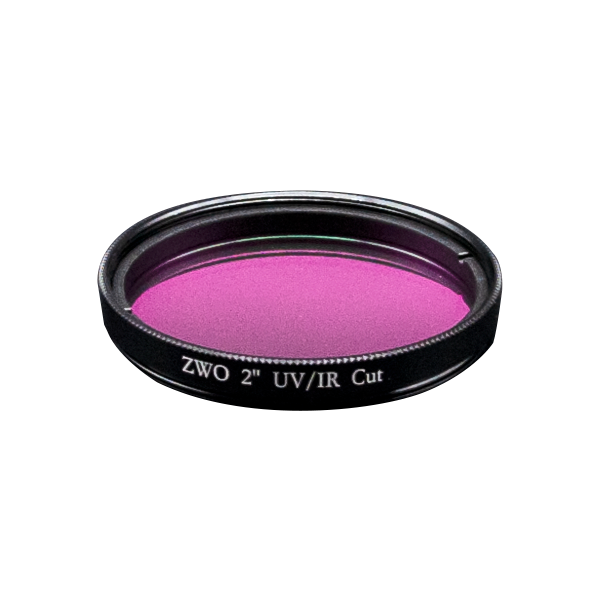 It is ZWO’s full-frame cooled camera, has 6032 x 4032 pixels, and supports BIN2, BIN3, BIN4 mode. The pixel size is 5.97 μm x 5.97 μm. 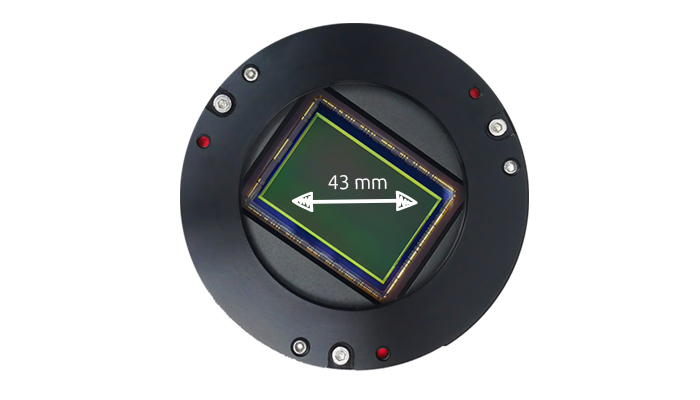 This camera provides 14bit ADC and its full well is 76000e. 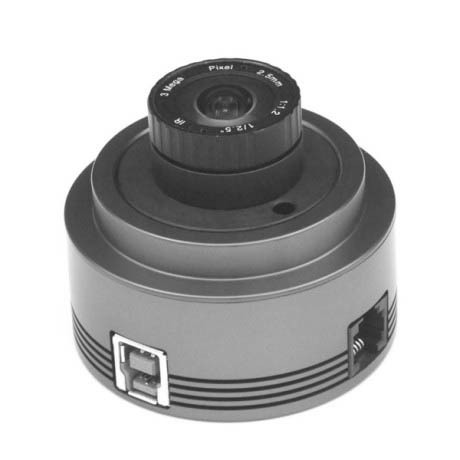 ASI128 Pro camera includes a 256MB DDR3 memory buffer to help improve data transfer reliability. Additionally, the use of a memory buffer minimizes amp-glow, which is caused by the slow transfer speeds when the camera is used with a USB 2.0 port. 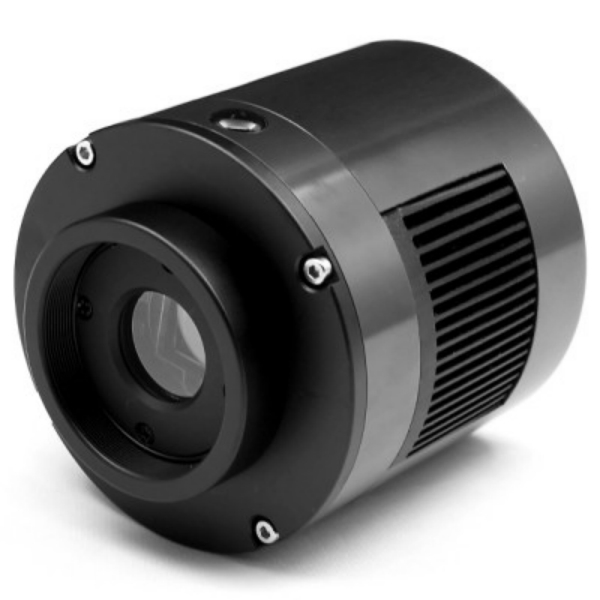 ASI128 Pro offers very good performance for astrophotography. 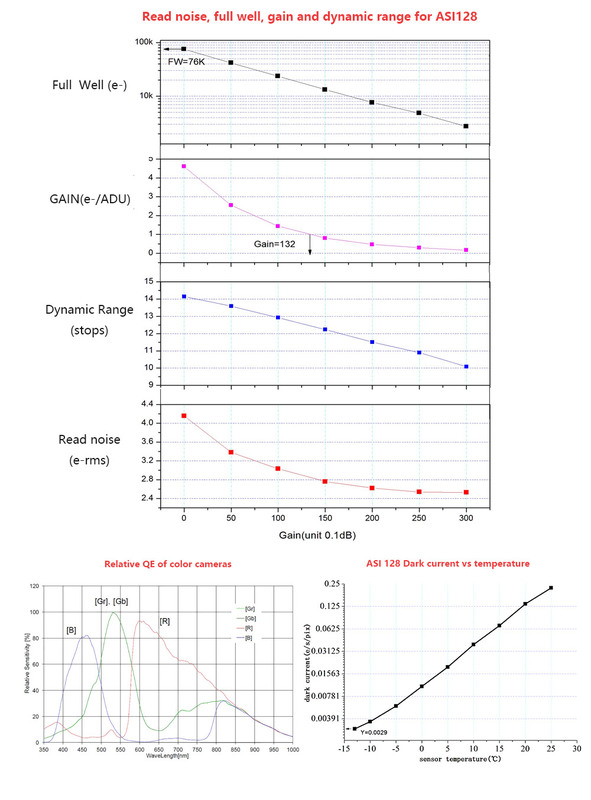 Low read noise, high dynamic range, QE peak 53%, AR protective window and much more. 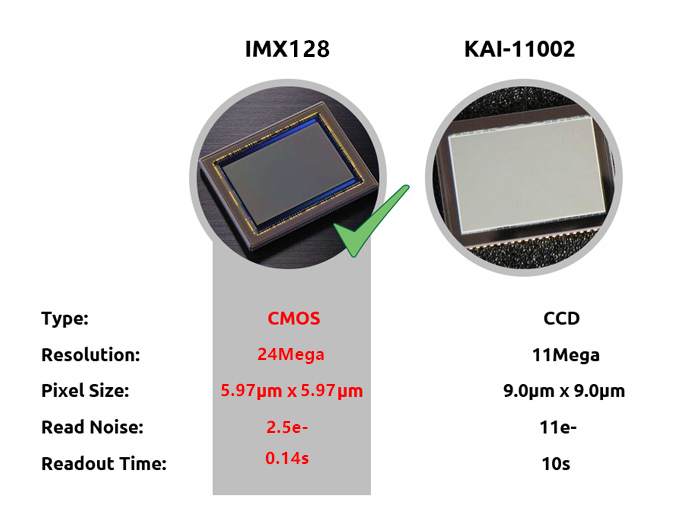 Compared to old fill frame CCD sensors such as the KAI-11002, the IMX128 has higher resolution, higher QE with lower read noise and faster FPS. 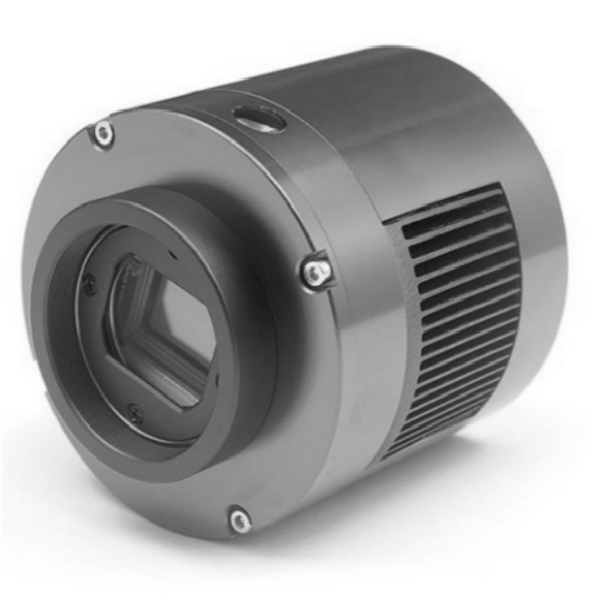 ASI128 Pro includes unique tilt adapter. Say goodbye to tilt problems forever ! 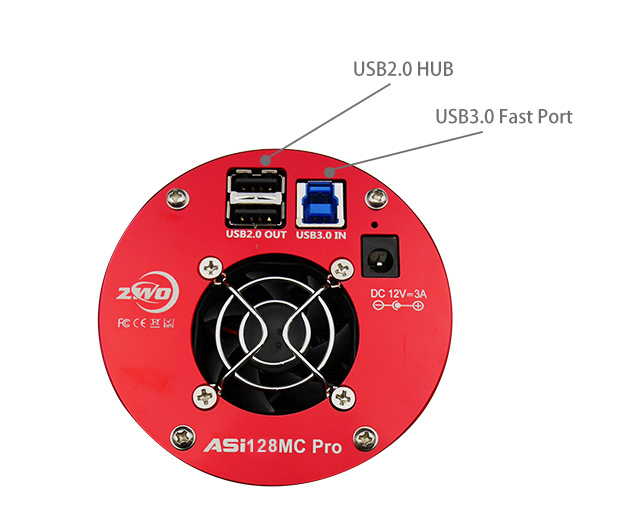 USB 3.0 Port: can provide 5Gb bandwidth to let ASI128 Pro run at 7 fps (14bit, normal mode) or 10 fps (10bit, high speed mode) at full resolution(24Mega). 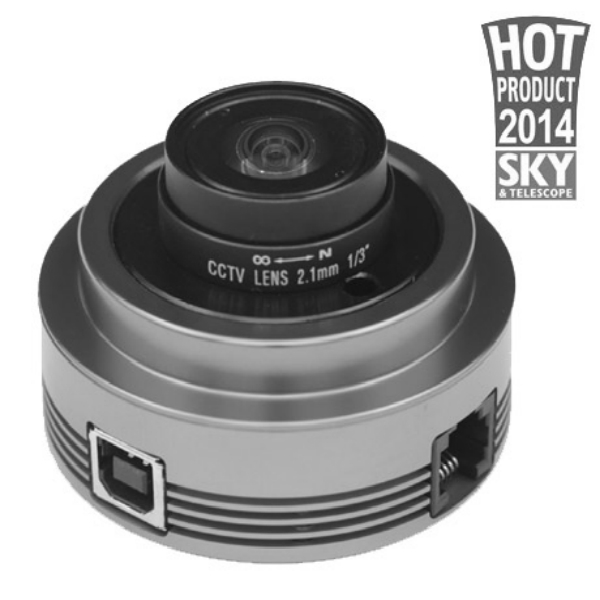 ASI128 Pro camera has one full frame sensor, so the power consumption (650mA@5V) is much higher than other cameras. But USB3.0 can provide 1000mA current, so ASI128 Pro can run standalone under USB3.0 host, it doesn’t need external power supply. 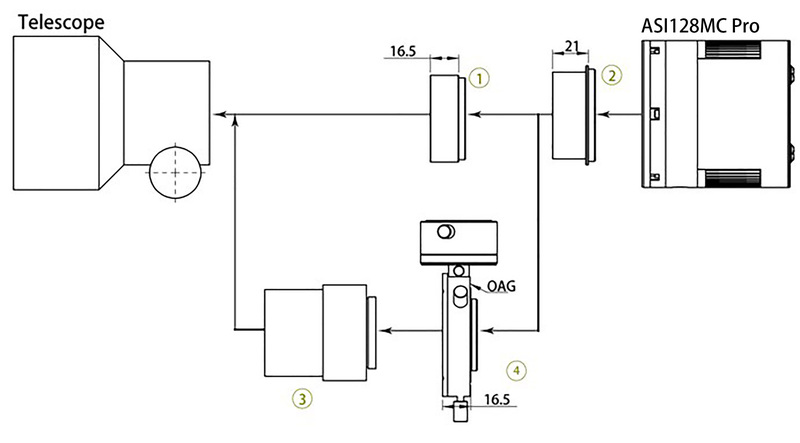 USB 2.0 HUB: can connect with various accessories, such as filter wheel, guide camera and electronic focuser, so you can manage your cable better with USB2.0 hub. 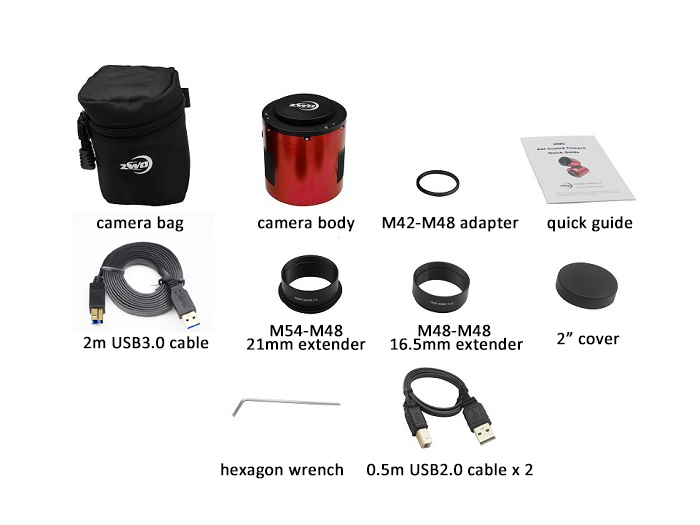 There are 2 short 0.5m USB2.0 cable come with ASI128 Pro. the power of hub source from external power supply if you connect it. 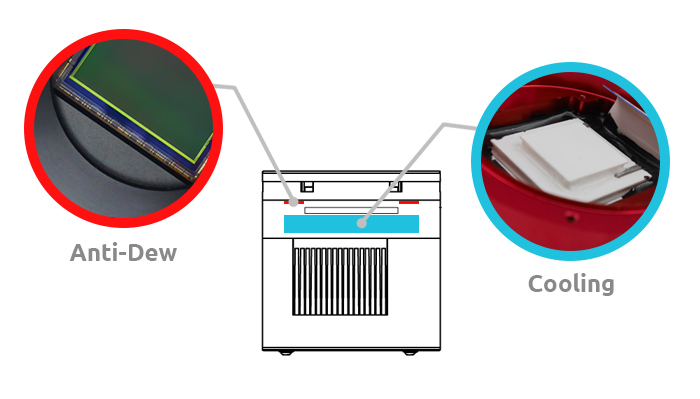 ASI128 Pro has a two-stage TEC cooling system that allows deep cooling (30°C-35°C below ambient). You will need an external power supply to power the cooler. 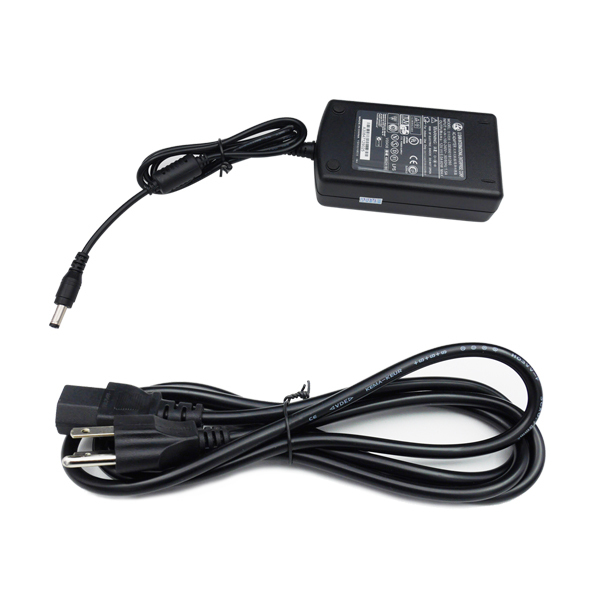 An AC-DC power adapter is not included in this package, however you can order one from here. The anti-dew heater can heat the protect window to avoid any dew problem happens, the heat power is around 3.6W and can be turn off in software to save power. ASI128 Pro box includes all necessary cables, adapters, and manuals. Does this camera works ok with the INDI driver? 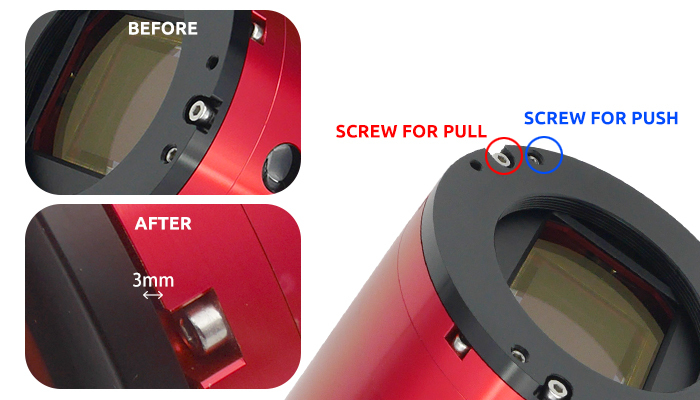 Is the camera available for shipping in the coming weeks? 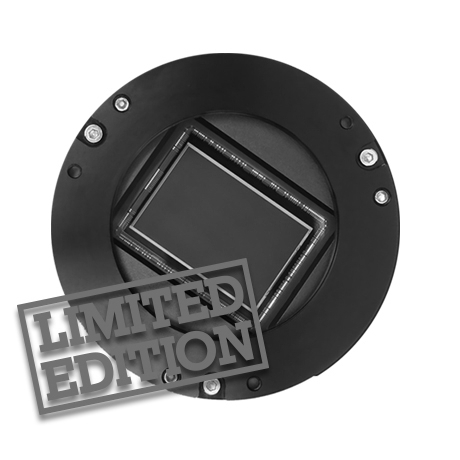 Sorry to tell you that it won’t be available for couple of weeks. Are there plans to make a mono version of the ASI128 Pro cool? If so is there a estimated release date. 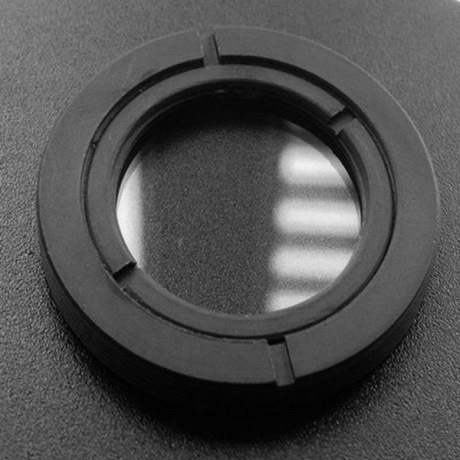 Are there any plans on making a 9 micron pixel mono cooled large format camera? 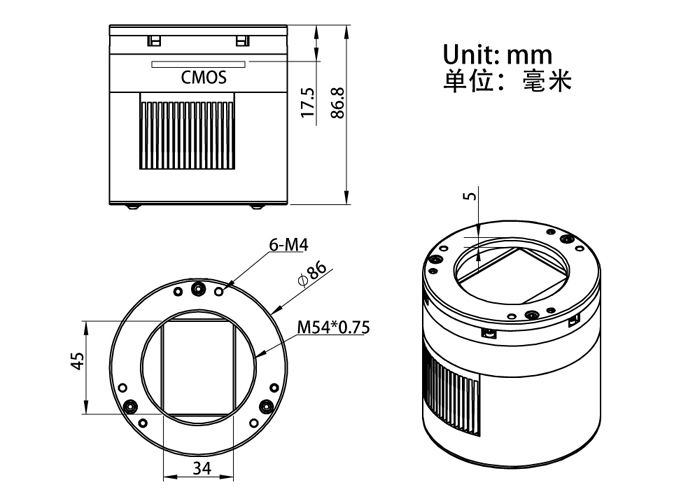 We are plan to make some big mono camera, but no estimate release date, when we are ready we will tell all our customers.